We’ve been there, done that, eaten it and cooked it. Post Thankgiving always included a lunch of leftover turkey-something. 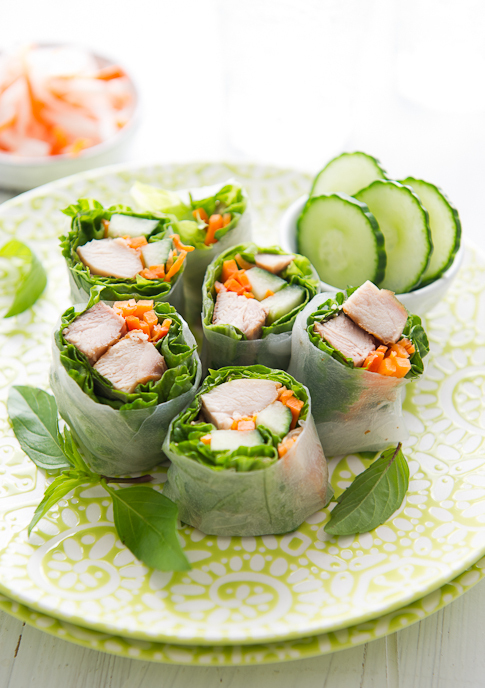 Sandwiches, spring rolls, quesedillas and turkey soup were our automatic go-to-gotta-eat-up-all-this-turkey dishes. This year, we’re committed to making something different that didn’t involve the turkey to be sandwiched in between something or simmered in broth. 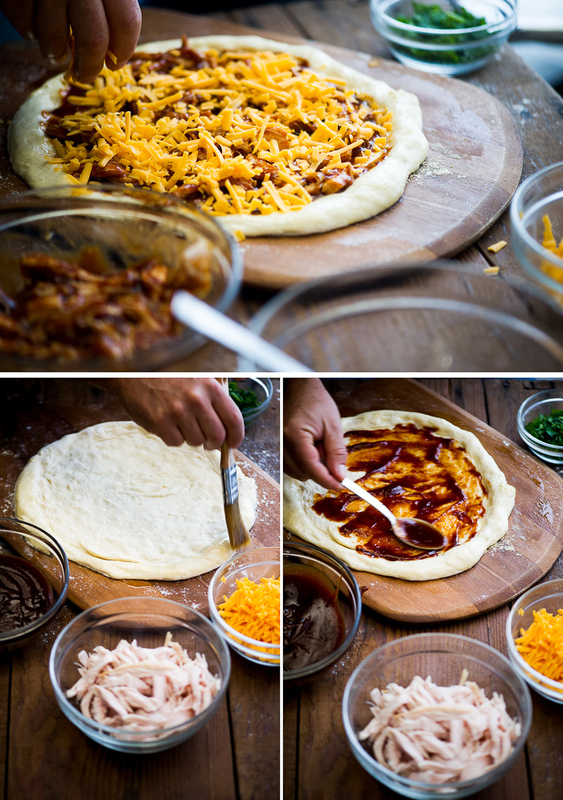 We’ve broken all tradition and are making bbq turkey pizza. Why not? 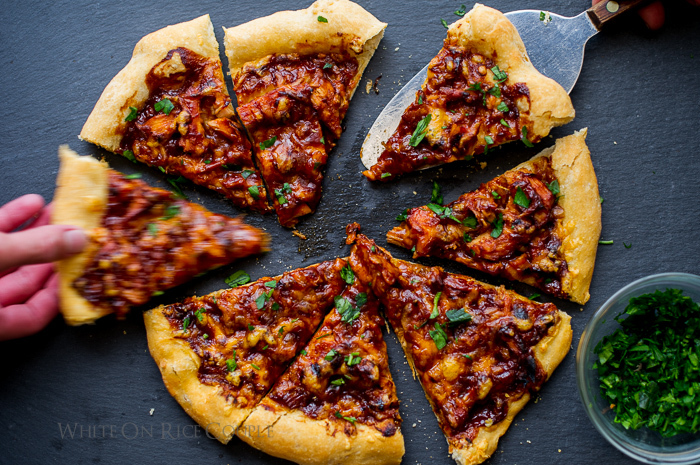 Everyone loves a bbq chicken pizza, so it seems perfect to do one with turkey. Let’s get rid of some of this turkey, ok? Let’s do this. 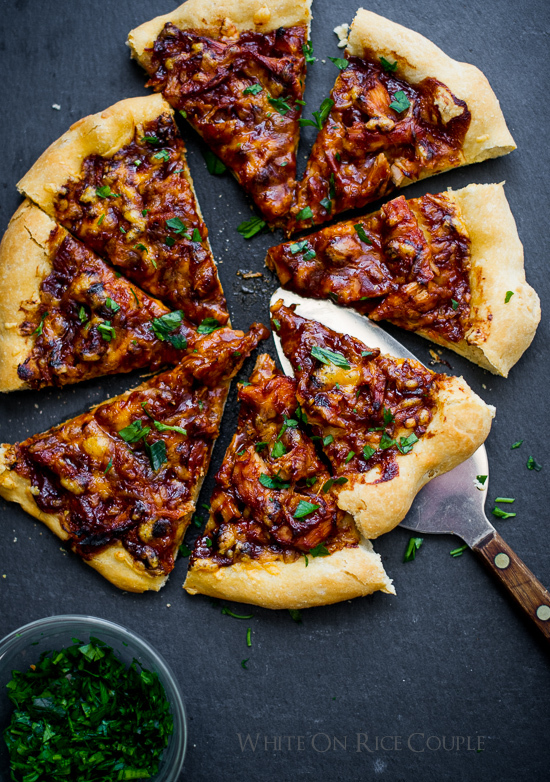 BBQ turkey pizza loaded with melted cheese will knock your socks off. Try it and trust us. Regardless of how much turkey there is left over, you still make this pizza with a small batch of turkey. The flavor comes from the bbq sauce base, the oven roasted turkey and melted cheese. Consider it an open faced bbq turkey sandwich and you’ll be happy to be eating something other than a regular ol’ turkey sandwich post-Thankgiving. 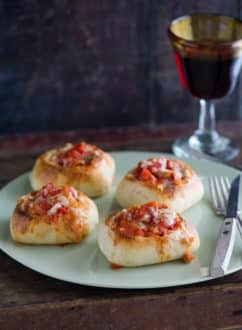 This same idea and ingredient combination can also carry over to other dishes such as french baguette pizza and flatbreads. If you have any leftover french bread, simply slice them lengthwise and add these same toppings. If we had extra stomach room, we’d probably experiment with some bbq turkey quesedillas. Add a few glasses of cold beer and we’re set. Leftovers can be so fun when you get a little creative. Hope you all have a wonderful Thanksgiving. 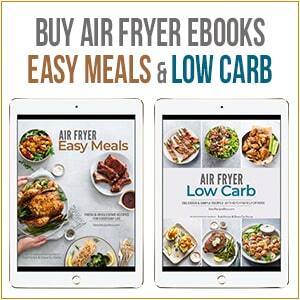 When it comes to connecting with folks who are obsessed with food, there’s never a dull story to share. 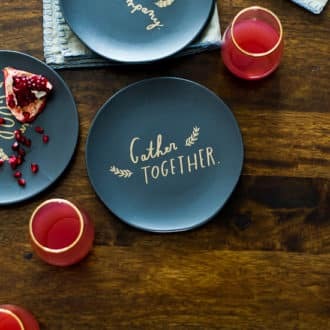 Everyone has a dish or family moment was talked about. That’s the fun of Thanksgiving. Enjoying all the food, the family drama and the talk about how exhausted we all are and how we can’t wait till next year. 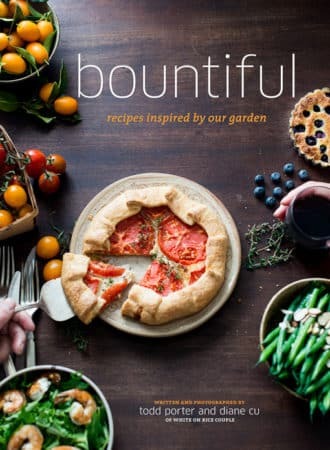 The pizza dough is from our cookbook, Bountiful. The dough and topping can easily be made the day before and then assembled and baked as needed. The crust comes out best if baked on a pizza stone in the oven which has been preheated for at least 20 minutes, however you can always bake the pizzas on a baking sheetpan in the oven if you don't have a stone. Just sprinkle a bit of cornmeal on the sheetpan before laying down the stretched out pizza dough. 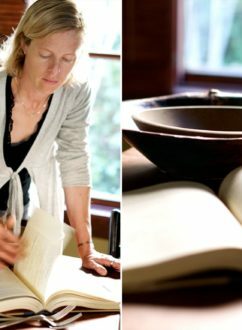 Here's a bit of the headnote from the book talking about handling the dough, "We’ve learned a lot from listening to great bakers and watching them bake their doughs. One thing they all seem to have in common is that they don’t overhandle the dough. The more you work it, the tougher it gets. With most of the great pizzas we’ve had, the bakers are not kneading their dough, but just mixing it and letting the yeast go to work. And when they handle their dough to make pizzas, it isn’t with a heavy, forceful hand, but rather by gently letting gravity stretch and form the dough. It is graceful and gentle. The amount of flour in the recipe should yield a dough that will be easy to handle with just a touch of extra flour for dusting when you are stretching it. If you are comfortable with handling the dough, experiment with putting a bit less flour in it. This will make for a lighter crust, but because the dough is wetter, it will be a bit more challenging to work with." If your oven doesn't go as high as 550°F, the pizzas will still come out great, it just may take a little more time and the crust might not get the char that we personally love so much. You can also use a liberal dusting of flour instead of the cornmeal to keep the dough from sticking to the pizza peel. Make ahead (Dough):In a large bowl or resealable container, stir together the water, yeast, honey, and salt. Stir in the flour until no dry streaks of flour remain. Cover the dough and set aside in a warm area to proof for 1 to 2 hours, or until doubled in volume. Set aside in the refrigerator until chilled, or for up to 1 week (see Note 1). When you are ready to make pizzas, preheat the oven to 550°F with a baking stone on the middle rack for at least 30 minutes. Have cornmeal and a pizza peel handy nearby for when you stretch the dough. Divide the dough in half and place the dough balls on a well-floured surface. Allow the dough to come to room temperature for about 30 minutes. The dough should feel soft and pillowy. While the dough comes to room temperature and starts to come alive, prep the topping ingredients so they will be handy nearby after you stretch the dough. Liberally sprinkle corn meal on the pizza peel. Set nearby while you stretch the dough. 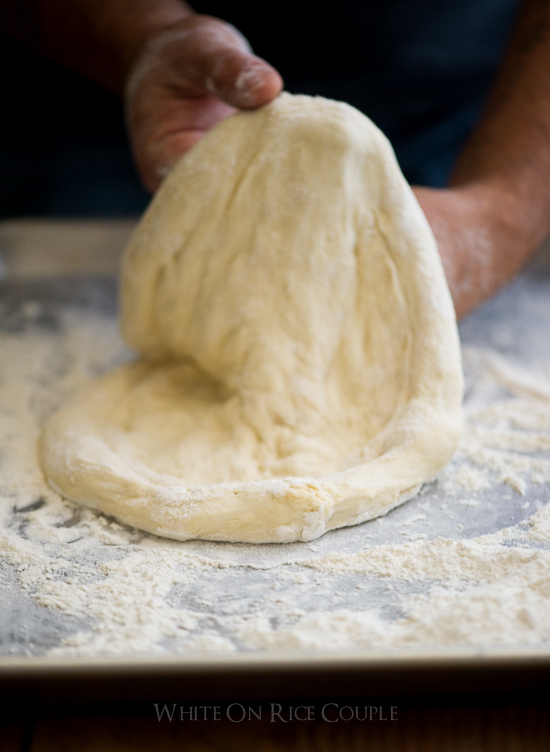 When the dough feels soft and pillowy, with floured hands, lightly flour the first dough ball. Using your fingertips, make indentations just inside the outer edge to form the outer crust rim (see photo in post). Using your hands, rotate and gently press out the dough, working from the center outward to flatten it, leaving the outer rim as untouched as possible. Gently push out to a circle 6 - 8 inches in diameter. Resting the dough on the tops of your hands, rotate and circle the dough over the tops of your hands, gently stretching the dough to about 10 inches (25 cm) in diameter. Make sure to keep the rim thicker than the center. (If the dough starts to toughen and spring back too much while you work on it, allow it to rest for a few minutes so it will relax and soften.) Lightly re-flour your hands, the work surface, and the dough as needed to keep the dough from sticking. Lay the stretched out dough on the prepared pizza peel. Give it a little shake to make sure the dough isn't sticking to the peel. 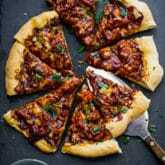 Gently brush oil on the outer crust. Shake the peel again to make sure nothing is sticking. Gently ladle and spread 1/2 of the sauce on the dough. Spread 1/2 of the turkey on the pizza, spread 1/2 of the cheese, and season with additional salt and pepper if desired. Bake for 10-13 minutes or until the crust is golden or even slightly charred if you like. While the first pizza is baking, repeat the stretching and topping instructions with the second pizza. Allow each pizza to cool for a few minutes, then slice and serve. Over time in the fridge, the dough will gradually begin to change in texture when it gets baked, and will also develop a sourdough flavor. We prefer the texture and flavor of the dough after 24 to 36 hours of refrigeration, but it is still quite good when chilled up to 1 week. I made this pizza tonight for supper. It was delicious! Thanks for posting it. I think I’m going to host a pizza party, after seeing all your beautiful photographs. Just a head’s up that the title on the recipe is incorrect – it says brusselsprout and bacon pizza. Thanks Patricia. Complete brain lapse on that title. Thanks for the heads up. What a great idea. With bacon and BBQ how can you go wrong! I’ve never tried the cornmeal technique, worth a try. 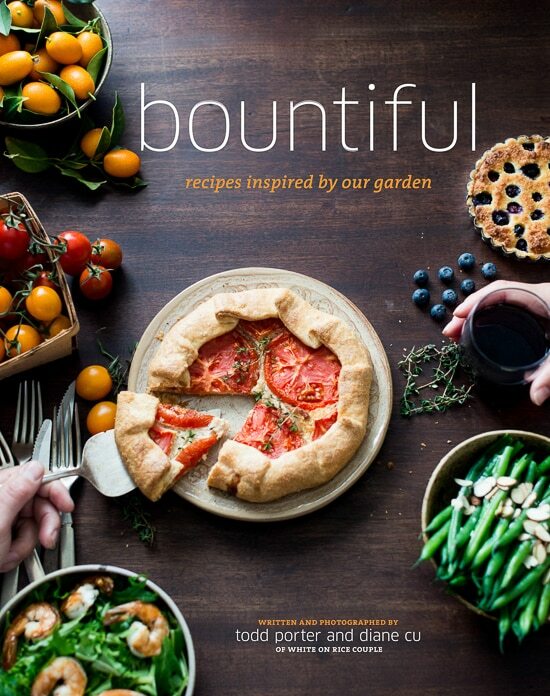 This looks so great, Todd and Diane! I simply didn’t have enough leftover turkey for everything I had planned 🙁 My go-tos are always turkey enchiladas and turkey pot pie, but so far I’ve only made a couple sandwiches and topped a couple salads and simmered turkey stock and everything is almost gone! SAD! I’m thinking of picking up a rotisserie chicken for this very pizza. Love your instructions on dough — perfection. 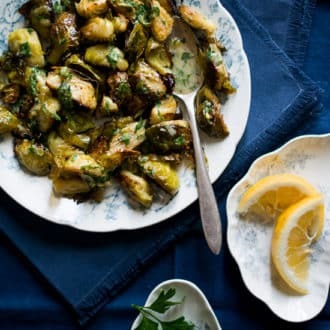 Also, we very much enjoyed your pan-roasted brussel sprouts with soy sauce and bacon on our Thanksgiving table! Thanks you guys! Looks great! We used up our turkey in your fabulous chicken pot pie galette, thanks! 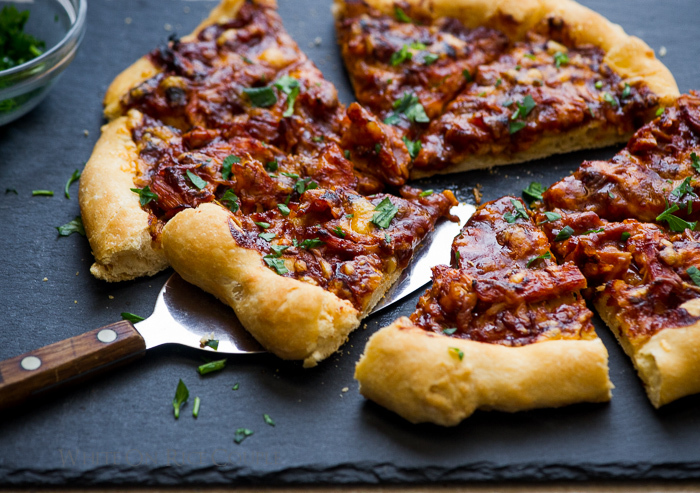 If only I had leftover turkey… *sigh* I may need to cook a turkey breast just to make this pizza. I would skip the roast for this pizza! It is amazing and looks too delicious! Yes!! You guys this looks amazing and something my family would go crazy for!! Great recipe and idea! I am so ready for anything that doesn’t look like Thanksgiving dinner! Can’t wait to try your pizza dough.